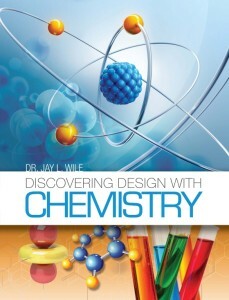 The cover for Discovering Design with Chemistry. I am sure that some of my readers are sick and tired of hearing about my new high school course, Discovering Design with Chemistry. I ask those readers for patience, because it is time to announce that the book has been released by the publisher! If you are in need of a rigorous, homeschool-friendly, high school chemistry course, you can preview it here. 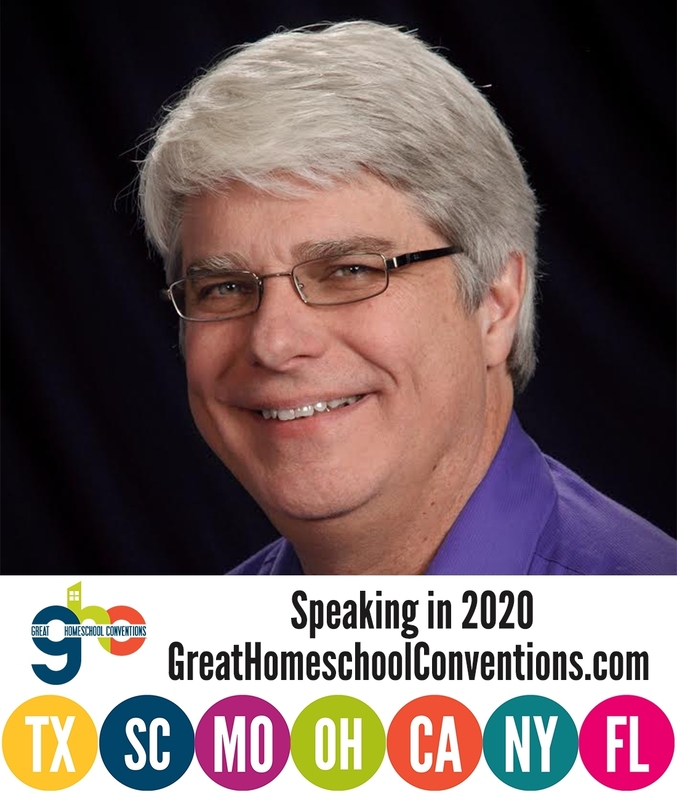 I have to point out that the course is ready for purchase a full week ahead of schedule, which is a testament to my publisher’s commitment to home educators and private Christian schools. It’s not easy to produce a high-quality text in less than a year, but Berean Builders was able to do just that. This new chemistry course is completely different from the previous one I wrote, Exploring Creation with Chemistry, 2nd Edition. It covers the standard college-prep chemistry topics in a different order, but more importantly, it emphasizes aspects of those topics in a way that makes them more relevant to this decade. For example, when discussing Dalton’s Atomic Theory, I point out that he used his theory to predict something about the masses of two elements that can react to form completely different compounds. That prediction was later confirmed, and we now call it “The Law of Multiple Proportions.” I point out that a theory can’t be considered scientific unless it can make such predictions. I then discuss this in the context of creation science. I talk about how the scientific theory of creation has been used to make many successful predictions, including the fact that there is very little “junk DNA” in the human genome. The most important difference between the courses, however, is the experimental component. When I wrote the older course, I had the students perform the best experiments they could with reasonably-priced equipment. Since that book was written, however, the cost of certain chemistry equipment, such as precise mass scales, has gone down significantly. As a result, what is available at a reasonable price today is quite different from what was available back when the old course was written. Because of this, the experiments are significantly better in this new course. 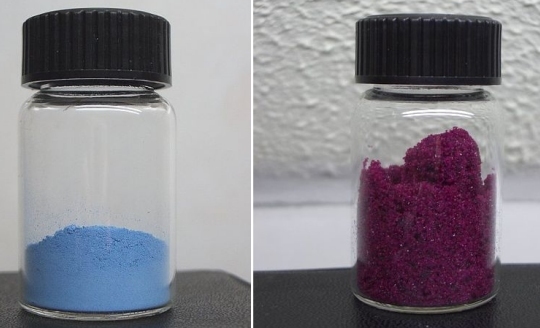 You might think these are two different compounds, but they are not. Both jars contain cobalt (II) chloride. The reason they look different is because the solid on the left has no water in it. As a result, we call it the anhydrous form of cobalt (II) chloride. The solid on the right has water in it, so we call it the hydrated form of cobalt (II) chloride. Both solids perform exactly the same chemistry. The only difference between them is the presence of water. Now don’t make the mistake of thinking that the water is chemically bonded to the cobalt (II) chloride. It is not. If you heat the hydrated form of cobalt (II) chloride, the water will simply evaporate, producing the anhydrous form. In other words, if you heat the purple solid, it will slowly turn blue as the water evaporates from it. In my new chemistry course, students do this experiment with copper (II) sulfate. The kit that comes with the course contains the hydrated form, which is blue. The students measure the mass of a sample of this hydrated copper (II) sulfate, and then they heat it. As time goes on, the blue hydrated form turns into a white powder, which is the anhydrous form of copper (II) sulfate. Once the sample is completely white, they measure the mass again and see that it has decreased. Why? Because water has evaporated from the sample. The students use that change in mass to actually calculate how many molecules of water are incorporated into the solid for each ion in the sample! They then add water to the white powder and watch it change back into the blue solid with which they started the experiment. Students can do an experiment like this at home (or at a small, private school) because inexpensive digital mass scales that have a precision of 0.1 grams have been produced. One of those scales is in the $70 kit that comes with the course, and as a result, students can do some really incredible experiments. In addition to the one I just discussed, for example, they can determine the amount of sodium bicarbonate in an Alka-Seltzer tablet (or any other effervescent tablet). There are other really great experiments in the course as well. For example, students look through a feather at a light bulb that is a couple of meters away from them. When they do that, they see multiple images of the light bulb, and each image has a rainbow attached to it. This is because the light waves interfere with one another as they pass through the thin slits between the barbules of the feather. In addition, students use steel wool to see that even metals can burn, and they do an experiment which demonstrates that a catalyst is not used up when it changes the rate of a reaction. There are a total of 46 experiments in the year-long course, which gives the students significantly more laboratory experience than most students would get in a public school. Discovering Design with Chemistry is a great read for the new chemistry student. Dr. Wile’s descriptions of chemical principles are very easy to understand and are backed up with experiments that aid the high school chemistry student in grasping these chemical principles. Additionally, Dr. Wile exhibits excitement that should capture the student’s attention. A refreshing theme is Dr. Wile’s use of chemistry to illustrate the design that exists in God’s Creation. The short descriptions of several of our great scientists and how their faith has affected their work is a wonderful addition to this subject. I wholeheartedly recommend this book for the student who desires a college-preparatory high school chemistry course. Having been taught by Dr. Wile as a professor at the university level, I can still experience his voice and his excitement for the subject of chemistry throughout his writing. His easy, personal writing style made me feel at ease as I ventured through the text. Most of all, his faith is weaved throughout the chemistry content in challenging and authentic ways. I can tell his chief desire is to share with his students the glory of our Creator through studying world around us. Wow, good news! This was some great work on your part. I continue to run into students who have used your textbooks and am always satisfied with their knowledge and ability. This is especially encouraging as I teach college chemistry. Thanks! Hard to imagine anything better than his old chemistry book. That prepared my kids so well for college chemistry at Texas A&M. I almost wish I was still homeschooling so I could use this new one. Good work, Dr. Wile! Looks great! I have a question about the experiments. How do they compare to your old textbook as far as ease of use? Do you think the older ones were easier to perform in a home setting? And do you think using the older textbook is a disadvantage in any way? I have a couple years to decide but I already own the 2nd edition Apologia Chem book. Thanks. Thanks for the question, Erin. The new experiments are just as easy to do at home, as long as you have the kit. I don’t see a big disadvantage with using the second edition. It has been preparing homeschooled students for university for years. I am wondering if there is a helpline for this chemistry book. I am sure that my daughter will come up with questions that I can not answer. Thanks for asking. There is one. The introduction to the book gives you the address for a website. Once you register (registration is free and your information will not be shared with anyone), you can ask me questions as well as browse and search through previously asked questions and their answers. I just received the 2nd edition of your book, but am interested in this one. What would the biggest differences be between the two. Which one makes it easier to understand and learn for our daughter. The biggest differences are the experiments and the order of topics. The experiments are much better in the new book, and the order in which I introduce the topics in the new book starts with atoms, instead of with energy, as it is in the older book. Some students might find this new order easier, as it puts off most of the really hard math until much later. As far as which one is easier to understand, I can’t properly evaluate that, since the new book hasn’t been used yet. I think I explain some things better in the new book, but that’s my perspective, not a student’s. What if you live outside the USA and cannot get the kit? Can you get the stuff elsewhere? It depends on the country, I think. The people who put together the kit will ship to other countries, but the cost might be prohibitive. Even without the kit, you can do 27 experiments that span 15 of the 16 chapters. Are you planning to publish the audio book? If so is there an estimate when it will be available? We are very interested! Yes, Coralie. My publisher has already started the process. The current plan is for it to be ready by summer of 2016. I am so relieved to hear about your new Chemistry course. Do you plan on releasing a new version of your Physics text as well? If so, when will it be available? I don’t plan on writing a physics course, but that doesn’t mean I won’t. I had no plans to write a new chemistry course, but Apologia’s new edition of chemistry was so bad that I didn’t feel like I had a choice. I will only rewrite the physics if Apologia ruins it the way they ruined the chemistry course. 1. Should we have questions or problems while using the materials, will Apologia provide support? Or can we email you with those questions? 2. Is there a way that we can add to the ‘meat’ of the experiments for the older course (if we buy a better scale to add to our older kit)? Thanks, in advance, for your reply! 1. I have heard that Apologia’s support has declined significantly over the past few years. If you can’t get support from them, please feel free to ask me your questions. 2. Unfortunately, I am not sure how you can do that. Adding the mass scale won’t really help, since you need instructions on the specific experiments that utilize the mass scale. Thanks so much for the offer of assistance. Hopefully it’ll not be needed, but it’s great to know that you’ll still stand behind the ‘old’ material. That’s service!! In regard to experiments, are there video sources that you might highly recommend we use to supplement if we cannot ‘do’ more substantial experiments like the newer program covers? Will you be taping your new program? I won’t be taping the new program. I personally don’t think that’s a good thing to do with my courses. Apologia did that over my objections once I sold the company. I honestly don’t see how videos would help in your situation. The way I write my courses, the labs are intimately linked with the material. It’s not clear how much benefit your student would receive from the labs, since he is not doing the course for which the labs were designed. Thanks, Jay. I appreciate your candor! We’ll just do the 2nd Ed as written and be glad in it. My students are aiming for computer science and sports medicine careers so they do need to be well prepared for college science. Based on past success, I’m sure the 2nd Ed will serve them well, even if it’s not as robust as your new program. However, I guess I need to be paying closer attention to what might be in store for the physics and human anatomy programs since those will be next up on our plate! Actually, Apologia already did a new edition of the human anatomy course, and I strongly recommend it. So far, they have not changed the physics. Not to make light of chemistry safety, but thought you’d enjoy this. I had my older son, Scott, help his little brother with the experiment in Chapter 3 (?) on burning substances to see the flame color. Scott did not put the plate in the sink as directed, but said, “I have a BS in chemistry. I’m putting the plate on the counter.” All went well, although we had some nice, high flames on the kitchen counter. Those know-it-all homeschool grads. I probably would have done the same thing right after I had gotten my degree, Kathy! More Reasons To Doubt Iron as a Preservative for Dinosaur Tissue Is Soft Tissue Common in Dinosaur Bones?